Al Baha and Abha are two locations that were mentioned to me by the recruiter at the time of the original interview that selected me and brought me to the Ta'if region and to Al Muwayh over 19 months ago. At that time, he had asked me whether I would like to go to Ta'if, Al Baha or Abha. I did not know about any of those places, and he had then taken the liberty of "selecting" Ta'if for me ... on my behalf ... thus sealing my fate. In the event, I guess Ta'if has been okay, but, considering the climate and the environmental benefits of the other two places, I would have chosen either of the other two places over Ta'if ... but then, there's no use thinking about what might have been, is there? 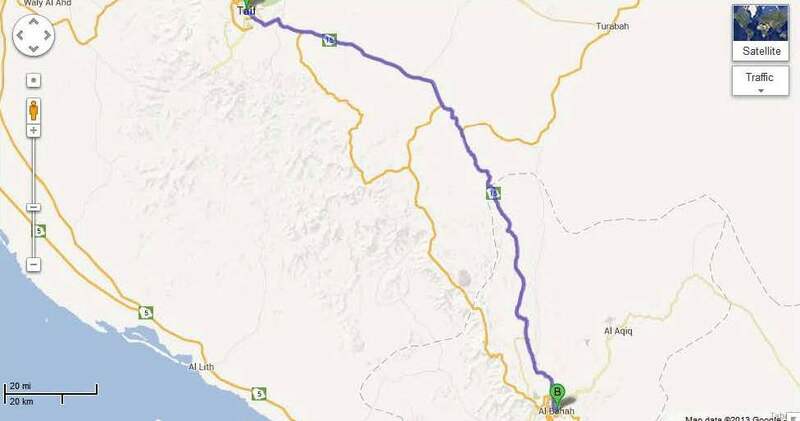 So, here I was, about to embark on this ambitious long car drive to Abha via Al Baha. My original plan was to drive all the way to Abha, and stay there for 2-3 nights. I started from my hotel in Ta'if precisely at 45 minutes past nine, and I resolved to complete my journey in 7 hours or so, a journey of about 540 km - over half of it over hilly terrain. My first 125 km were uneventful. I passed by places like Al Saar, Giya (the same one that I had seen on my way to Missan a month ago), and others. At one point, I came across a row of houses made to look like honey-bees' hives! These guys were selling honey on the road. I spoke to one of the vendors, a Bangladeshi by the name of Mr. Noor. 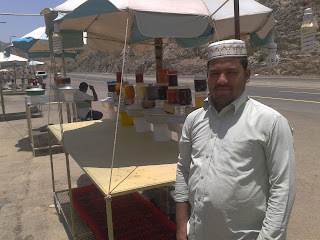 He told me this honey that was displayed outside ranged in price from SR 10 per kilo to SR 100 per kilo. The quality varied depending on the purity of the honey. He said the jars behind him in the picture below were only for display and that the actual stuff was inside the hut behind him. He asked me if I wanted any, but I denied politely. It was when the road started climbing that my trouble started. It wasn't about the fact that the roads were very steep or that they weren't made properly. As you already know by now, almost all roads in Saudi Arabia are excellent. The thing is, I started to get some shuddering movements from the car when I took it on the slope, and I had to shift down to the second gear to keep moving. After another 30 km or so, the problem worsened so much that I had to stop the car and take advice from Choudhary Shabir. He told me that he suspected the problem to be a defect in the pump and filter device that carries the petrol to the engine. He asked me to pour water over the pump device to cool it, and to start the engine again and carry on. With this first aid, I was able to travel another 5 kms, After this, the engine simply stopped. I was stranded among the hills, with no habitation in sight. I kept pouring water over the fuel pump, and also put a moistened cloth over it, and waited for an hour, but on repeated attempts, the car would not start. I then initiated a new line of communication with my doctor friend from the Al Baha region, Dr. Kishor Desai. He has been in Saudi Arabia for over ten years, I think. Unfortunately, he does not have or drive a car. However, he gave me some numbers of guys in Al Baha who might be able to send me a towing service car to bring the car to Al Baha. Thus, while the car was cooling down, I started a series of phone calls to governmental and private towing services. On the other hand, I kept urging the Choudhary to drop his work and come and fetch me from this place. It seemed as though both the channels weren't working. I even tried to stop passing cars to get some help, but it was a futile exercise. Not one, I repeat, not even one car as much as slowed down to ask me what the problem was. I was getting despondent. With a limited amount of eatables in my car, and even less drinking water, I was slowly but surely getting stressed out. And while this was going on, clouds appeared over the hitherto clear skies, and the heat reduced appreciably. Either it was because of that, or because my luck had finally turned, so that when I once again tried to start the car, its engine kicked in smoothly, and I was finally on my way! The place where I had got stuck was about 55-60 km before Al Baha, and I drove cautiously from there on. I called up the towing guy to tell him not to come, and also the Choudhary to give him the good news and to tell him also to not come. I passed smaller towns, then past them to bigger ones, as I neared Al Baha city. and these are REAL CONIFERS ... on the road dividers! It was at about half past four that I stopped at a Toyota shop to buy a new fuel pump and a fuel filter; from there, I went to a garage to get both the items replaced, and it was at five that I finally drove out of the garage and sped to Al Baha, reaching the city after about 30 minutes. My search for a room ended after yet another hour, and I was in Room 304 of the Al Airy Hotel after a short trip to fetch my car from where I had parked it earlier, and grab a cup of tea ... at half past six. It had been a long trip, and I was now here in a comfortable room. The journey of about 220 km had taken nearly 7 1/2 hours. More about my evening activities in the next post.